Early Sunday morning, November 23, 2014, Sister Rose Marie Franklin died peacefully in Maryknoll Sisters Home Care III, where she had been a resident since December 2009. She was 88 years old and had been a Maryknoll Sister for 70 years. Sister Rose Marie generously donated her body to science. At Reception, she received the name Sister Rose Mariel. 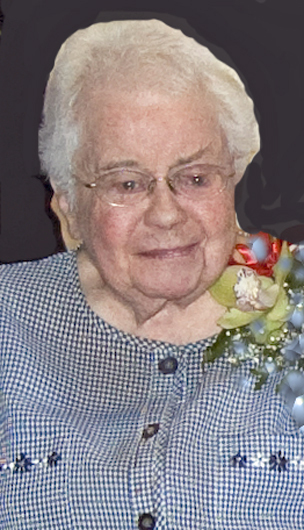 Rose Marie made her first Profession of Vows on March 7, 1947 and her Final Vows on March 7, 1950, both here at the Motherhouse. After First Profession, Rose Marie did secretarial work for the Maryknoll Fathers while living at the Center or at nearby Crichton House. Then, in 1953, she was assigned to Pusan, Korea when Sister Mercy requested a secretary to help with her voluminous correspondence. Thus began a mission career that proved to be beyond Rose Marie’s wildest dreams. Her early years in Pusan found her living on a bustling compound, which, in addition to housing the famous Maryknoll Sisters Clinic, was also home for the 30 some Sisters who staffed the clinic along with many Korean doctors, nurses and technicians. Rose Marie worked for Sister Mercy, then Sister Angelica and lastly, Sister Mary Augusta (Mary Hock). Every month long lists of Sponsors arrived from the Center and each person listed received a personal letter of thanks. Rose Marie would get other Sisters to help her with this huge typing task but did the major part of the acknowledging herself, having the Regional Superior sign the letters. In addition, in such a busy place, she was soon given many other jobs. After two years of part time language study, she herself took over the language program, when Patricia Desaulniers was assigned to the Philippines. Despite the challenge of what is considered one of the most difficult languages for Americans to learn, Rose Marie comprehended so well the many grammatical rules that she gave classes to the newly arrived Sisters to help them begin to understand how to form sentences. She left the pronunciation and expression to the Korean teachers! In 1964, Rose Marie was sent to Kang Hwa Island, off the west coast of Korea, where the Sisters had set up a clinic in a Maryknoll Fathers’ parish. Here, she worked in the clinic, giving support to patients and their families and making home visits. There were several textile factories in the town, which employed many young female workers who labored under very difficult conditions. To help them realize their dignity and rights, Rose Marie worked with Fr. Mike Bransfield and the other Sisters in educating the women according to the principles of the Young Christian Workers. This work incurred the wrath of the factory owners, especially when the women went on strike! In 1966, Rose Marie took the eight-month Catechetical Certificate course at the East Asian Pastoral Institute in Manila, PI. Upon her return to Korea, she was assigned to the city of Inchon where she again worked in the Young Christian Worker Movement, but also participated in catechetical work on the diocesan and national level. It was at this time that Rose Marie helped with the establishment of the National Religious Sisters Association for which she was the first Vice President. Rose Marie was keenly aware of her need for more education and in 1971 enrolled in the undergraduate program at the University of Guam where she majored in Sociology. Upon graduation, she received grants at Western Michigan University for a Masters and then a Ph.D. in Sociology, which she completed in December of 1978. After graduation, she was appointed Director of Research and Planning for the Congregation. During her four years in this office, Rose Marie visited many of the Regions, helping Sisters to learn the process of Program Planning for our various ministries. She became our “Objectives, Goals and Targets” guru! In October of 1982, Rose Marie was assigned to the Eastern Region. While living in New Jersey, she worked as the Coordinator of Development and World Order at Global Education Associates in East Orange, New Jersey. Then from 1983-1984, using her skills as a sociologist, Rose Marie was an Interviewer for Louis Harris & Associates in Manhattan. After that, until 1990, she was Coordinator of the Peace & Discernment Program at the Intercommunity Center for Justice and Peace in New York City. During her time at the latter Center, Rose Marie had the opportunity to visit North Korea as a member of a three person ecumenical delegation. The Committee for a New Korean Policy, based in Albany, New York initiated the visit. This Committee had established relations with the Korean Society for Cultural Relations with Foreign Countries based in Pyongyang, North Korea. Rose Marie, along with a minister of the United Church of Christ and a minister from the Disciples of Christ, visited North Korea from October 9 to 19, 1984. The report, which Rose Marie wrote after the visit, reflected a more open society in North Korea than what is experienced today. The delegation met with Presbyterian ministers from the Christian Federation, one of whom was also a member of Parliament! Also , while living in New Jersey, Rose Marie volunteered in the local Korean parish where she was a Eucharistic Minister and an advisor to the councilors of the Youth Group. In October 1990, Rose Marie was elected to the CGB and served as the leadership’s General Secretary until March of 1997. In Sept. of 1997, Rose Marie returned to Korea and joined the Sisters in the regional apartment in Kay Yang Dong, Seoul. Here, she volunteered as a Pastoral Worker until 2002. Rose Marie made many friends in the parish and the Pastor, Father Kim was especially happy to have the presence of this “older Sister”. In addition, she reconnected with the Korean Sisters Association. Since she was Contact Person for the Korea Region, she was involved with the Association’s leadership and even instigated a protest prayer service at the Seoul Cathedral against the U.S. invasion of Iraq. In 2002, Rose Marie returned to the Center and worked as an Office Assistant in Congregational Personnel, until 2006 when she retired. As her need for assistance increased, she was admitted to the then MRC 3 and in February of 2012, assigned to the Eden Community where she chose North Korea for her Prayer Ministry. Despite her health struggles, it was often surprising to find Rose Marie so alert and aware of what was going on at the Center and in the world! When her eyesight greatly diminished, she appreciated having someone read to her. Marie Crowley and others did this service for her and found her interested and responsive. Even in her final days, Rose Marie advised her niece that she was not yet ready to die! She lived another week, going to God when she was ready! We would like to offer our condolences to her niece Kathy Painter and nephews William, David and Jeffrey Franklin. We also wish to thank all the staff members in Maryknoll Sisters Home Care who have so faithfully and compassionately cared for Rose Marie. We welcome our Maryknoll brother, Father Michael Zunno, who will celebrate this Memorial Liturgy.